With Sriwijaya set to to host Persija later today at Bumi Sriwijaya Stadium the Palembang based football club become the latest team to have played a home game at two more stadiums during the Liga 1 season. Nothing new of course in Indonesia where a 'home' base is a pretty fluid concept for some clubs but this season does seem to be surpassing others in recent years. Persiba of course lead the way. At the start of the season the powers that be decided their cramped Persiba Stadium in Balikpapan wasn't fit for purpose and with Batakan Stadium not yet finished the Honey Bears were forced to look elsewhere for a venue. They ultimately decided to use Gajayana Stadium in Malang (pictured left), different island, different time zone, and of course were welcomed to the unfamiliar city with poor attendance; except for the Arema game when they pulled in 20,000 punters. After a few fruitless games in Malang the powers that be changed their mind, something they have proved to be very good at doing, and they could after all play at Persiba Stadium before now moving into the swish new Batakan where they currently hold court in front of average crowds of 14,000 plus. Playing at different stadiums during a season is nothing new of course for Persija. Over the last few years they have played home games in Solo, Yogyakarta Sleman, Bali, Madura, Bekasi, Malang among others. Hell, they have even been known to play in Jakarta, their nominal home town. This season though has see the Macan Kemayoran seem fairly settled by their standards, playing at the Patriot Stadium in Bekasi while the Bung Karno in downtown Jakarta receives a makeover ahead of the Asian Games next year. However Persija wouldn't be Persija without at least one game played behind closed doors and so it proved when they were forced to host Sriwijaya back in June. Following a number of incidents outside Patriot Stadium the powers that be decreed Persija's fans should receive a one match stadium ban and the club switched the game to Wibawa Mukti Stadium in nearby Cikarang. Talking of bans, the powers that be do like to impose suspensions once in a while but as we have seen with Persiba they have also shown a willingness to change their mind when the mood suits them. Persib were supposed to have received the ultimate punishment after disturbances that marred their game with Persija but that decision was later overturned. Harapat Stadiums this season though the reasons for the switch have been more to do with spectator comfort and accessibility apparently; odd when you know how difficult it can be to get to SJH! While Persib got lucky with proposed stadium bans one club at least accepted their poison. 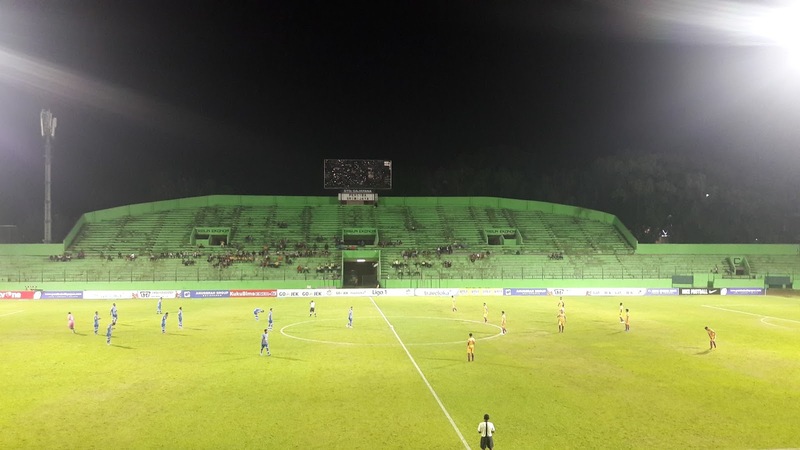 Borneo were forced to play a number of games behind closed doors and elected to host East Kalimantan rivals Persiba in Bontang, a near four mile drive up the coast from Samarinda. Arema's famous fan base has dwindled over recent years for reasons that aren't totally clear so in a bid to bring back the numbers that flocked to the stadium during their glory years the club decided to switch from Kanjuruhan Stadium, located out in the boonies and then some, to the more central Gajayana. It didn't work. Last but not least we have Madura United. An island lacking in any kind of footballing history they have been investing big time in recent years with the result they are seen as serious title challengers for Liga 1 this season. They started the season playing at Bangkalan Stadium which has the benefit of being quite close to the Samudra bridge that connects the island with the city of Surabaya on the mainland of Java. They have also played some home games at an even newer venue in Pameksan which is further east of Bangkalan and consequently harder to get to for visiting who teams who know they face a three and half hour drive once they have picked up their luggage at Surabaya's Juanda Airport. Seven teams playing at more than one ground, more than a third of Liga 1, is a pretty impressive haul, even by Indonesian sides. With a proposed World Cup bid on the cards, shared with the Thais, there is a certain irony in Indonesia looking to host the world's best when they struggle to find homes for their own club sides.